Saturday 18th April Bill assembled his mystery object. It’s made from off cuts. 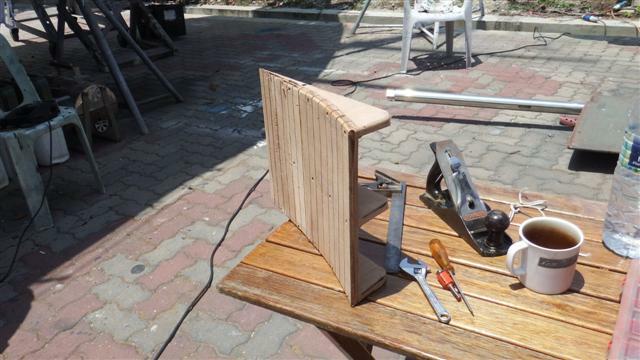 The piece of plywood needs to be shaped so by using a circular saw set to a depth it allowed Bill to make cuts to break the grain. 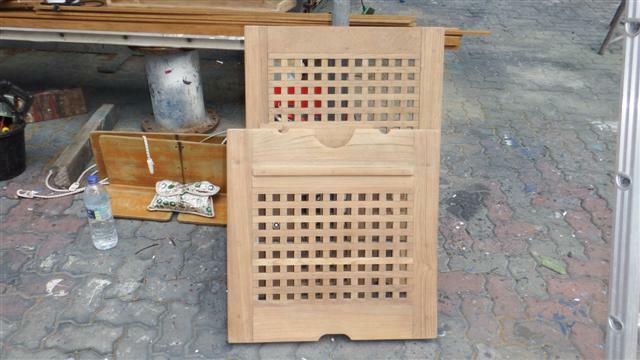 Three of the triangular shaped pieces were screwed onto them and they were both sanded down. They look like mini ski ramps possibly for the gecko’s don’t they but there’s no snow here. 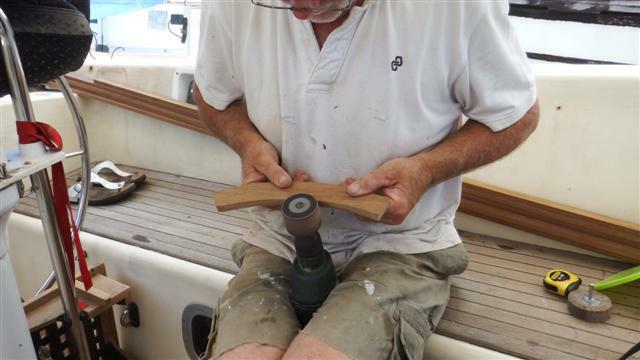 Bill continued to create the woodwork for the cockpit combing – no more sitting on the treadmaster and getting diamond patterns on your bottom! The rest of the day was spent removing the last of treadmaster and the old seating behind the wheel, it’s all going to be replaced with teak. That evening we had a lovely meal with Keith and Christine of Poco Andante and Jill and Aidan of Dunworking. Sunday 19th Bill decided the old jamming cleats would have to go. They’ve never worked properly and they were in his way but they put up a bit of a fight. 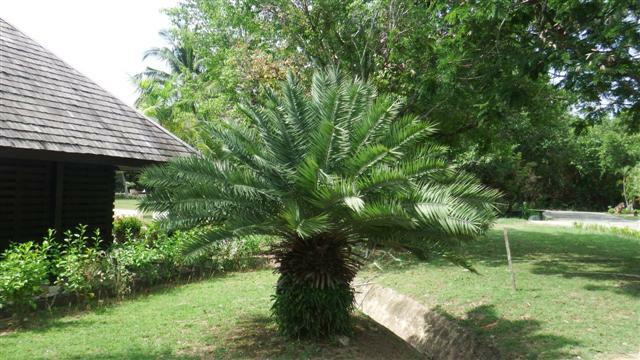 I decided to go and have my coffee in the resort and take some pictures of the palm trees here for my sister Amanda. 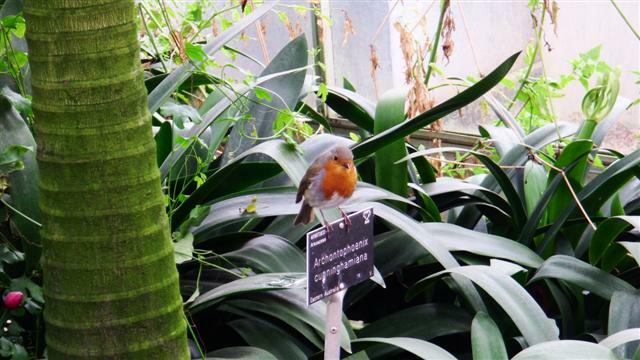 Remember we saw these in Wisley in the greenhouse. I know everyone thinks I should help Bill more but there’s really nothing I can do I just get in the way. I make sure he’s fed and watered and has clean clothes and a clean bed and that’s all he needs me to do. Sometimes he gives me jobs but he likes doing things his own way! When I got back he was fibre glassing the mystery objects. 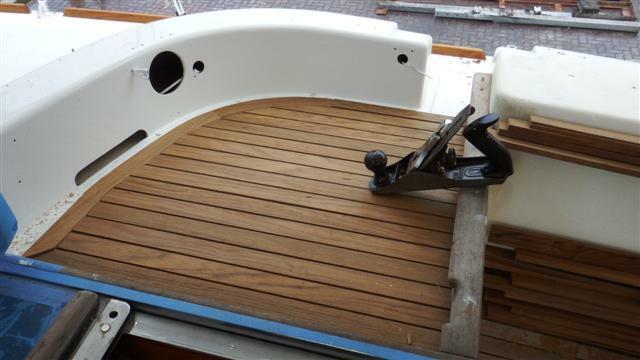 We spent the rest of the day getting things ready to reinsert the rudder. 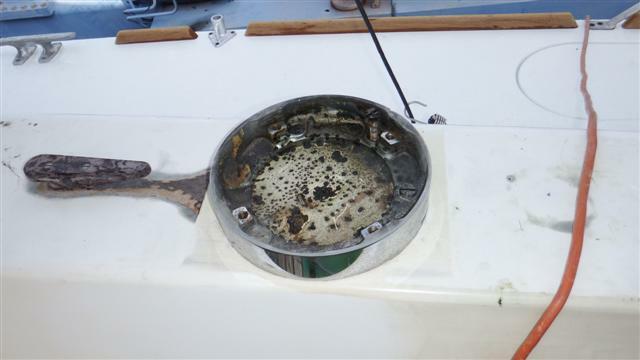 Monday 20th poor Camomile had major surgery to reinsert her rudder. The forklift moved the rudder into place before they brought the lift in. 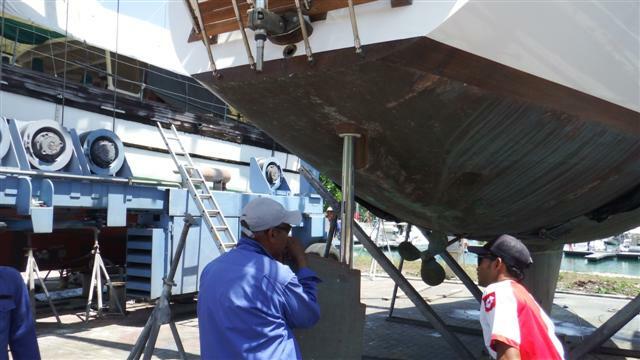 We had intended to go back in the water but we’ve still got more ‘out of the water’ jobs to do so we are just putting the rudder in and repositioning her. 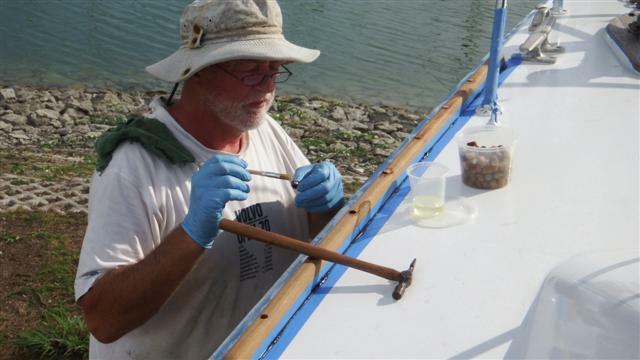 It took three of the crew to lift the rudder up into place. 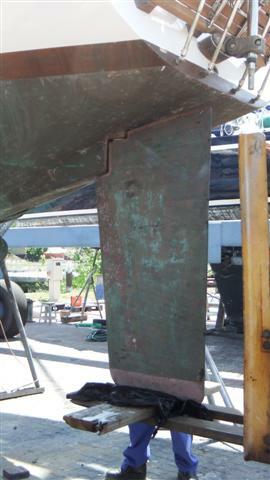 Once we were happy the rudder was located properly they starting lowering Camomile down onto it inch by inch but Bill was nervous of them lowering Camomile down onto the rudder because if the new bearings didn’t fit, the weight of the boat pushing down onto them would split them and possibly do further damage. 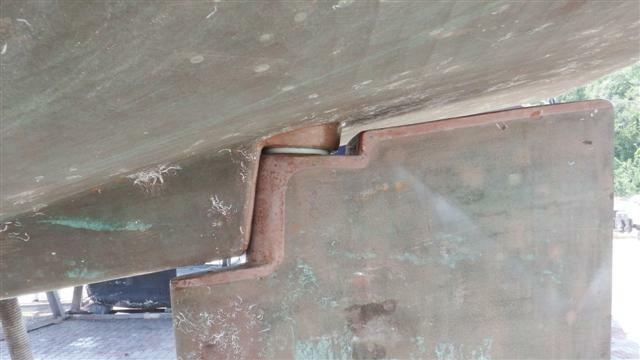 So Bill got on board and attached the studding to the rudder so it couldn’t fall out. 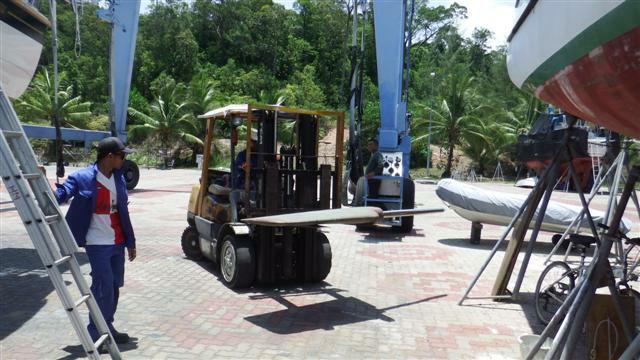 The forklift was brought in and placed under the rudder with the forks lifting the rudder into place. I was left on the ground to call out instructions; I’m good at that!! 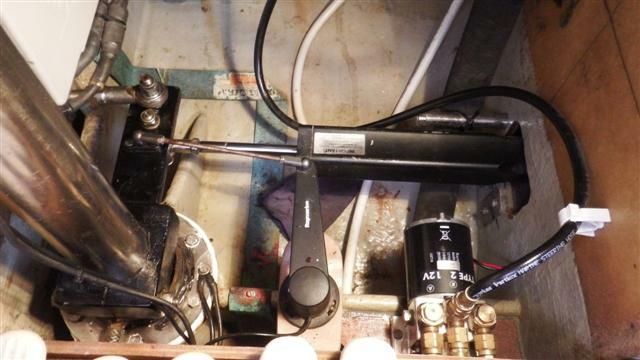 They stopped at the first red line so Bill could place the seal and the steering quadrant on then they continued to the second red line which was for the top quadrant which stops the rudder going to far. Bill put his head out of the hatch in our cabin to say everything was on. I asked if everything was in place ok and did he need a second pair of eyes to check? For which I received a few words; as if he would do something like that! The boys continued to push the rudder up until it was in place. The new bearings fitted perfectly, Bill was really pleased. 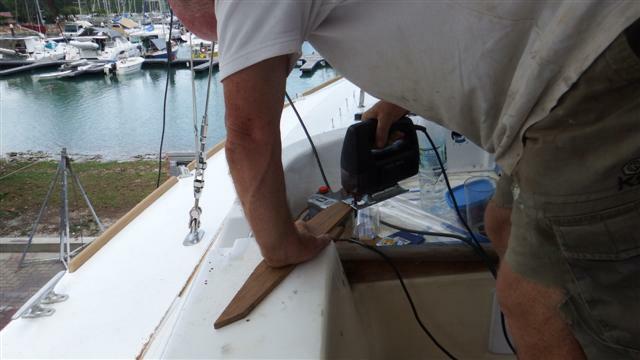 The boys sat Camomile back down again in a slightly different place so we could finish putting on the copper coat on the spots where the cradle rests had been and touch up the anti foul underneath the keel. The black quadrant at the bottom of the picture was upside down. 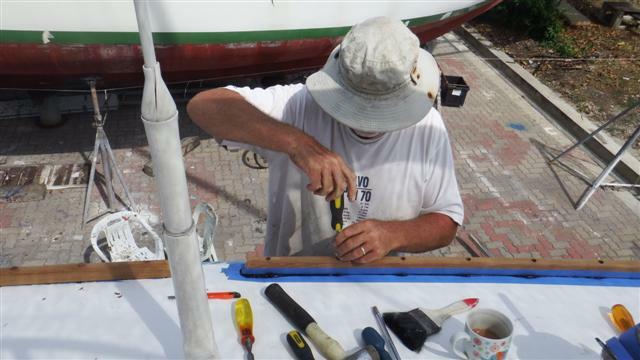 Bill spent the afternoon reattaching all the autohelm and steering gear to the rudder. 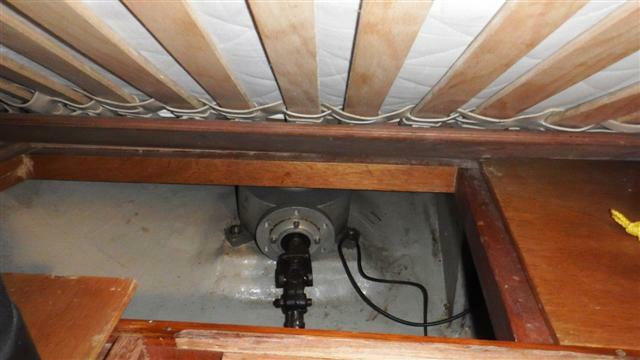 I could hear him swearing and cursing in our cabin so went to see what the problem was – he had put one of the steering quadrants on upside down! I said nothing. It was too late to do anything about it for now. Tuesday 21st we went to Thailand for the day. When you enter Malaysia you are given a 90 day tourist visa in your passport and to renew it you need to leave the country. I had a new one when I returned but Bill’s one was due to run out 1st May plus we needed to get his new passport stamped. We had been given conflicting advice some people said you could get a new visa by going to Thailand but some said you needed to be out of the country for 72 hours to get a 90 day one and if you go for the day they only give a two week visa on your return. So we thought the only way to find out was to do it. 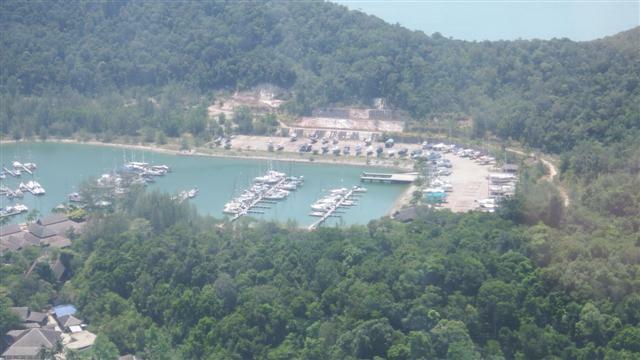 We took the 7.15 ferry across to Langkawi and a taxi to the ferry port. 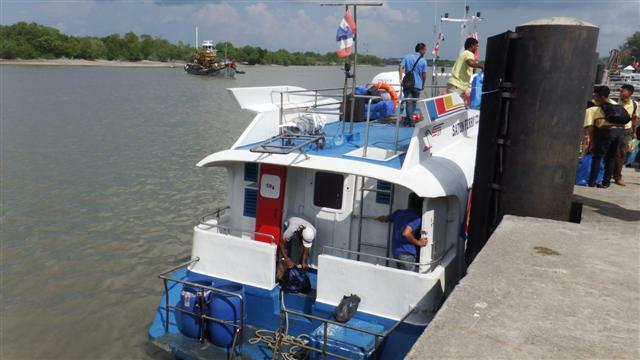 The ferry to Satun in Thailand leaves the ferry port 3 times a day and we were intending to take the 9am ferry. 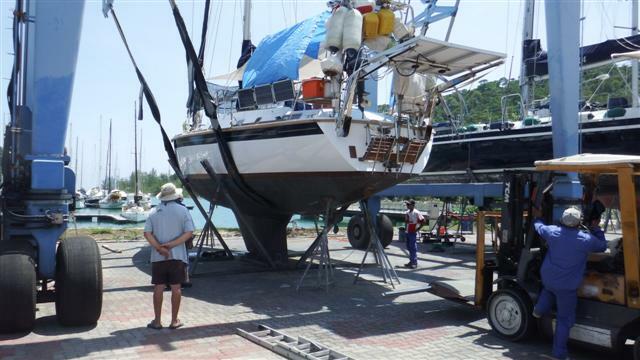 We went to immigration where we had originally checked in when we arrived and asked the question, ‘could we go to Satun for the day and come back and get a 90 day visa?’ We explained we were on a yacht in Rebak marina that was having work done and wasn’t ready to leave yet. The lady said it was ok; she would give us 90-day visa stamps on our return so we bought our tickets to Satun. We took both of Bill’s passports and they stamped us out of the country in his new one. The ferry took just over an hour. The instruments it had were very old fashioned. We were sitting ducks when we arrived and were immediately picked up by a local taxi driver wanting to give us ‘a tour’. It turned out the town was 15kms away so we agreed a price to just go to town and bring us back later. We could have probably got on a tuk tuk for a 10th of what we paid but the guy had a family to feed. 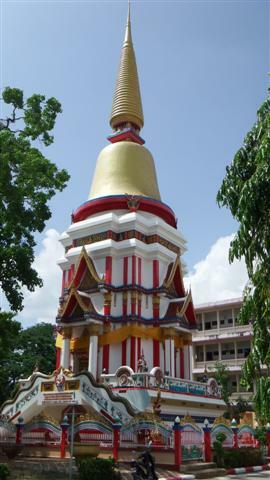 The town was fairly uninspiring although we did come across this colourful temple in amongst the houses. 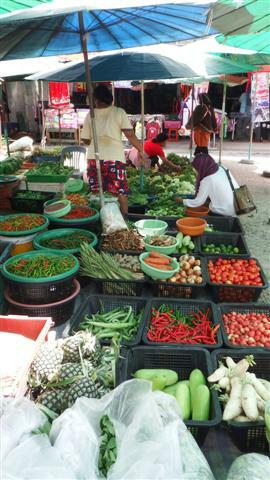 The market was very interesting with lots of local produce but we decided not to buy any and complicate the return. 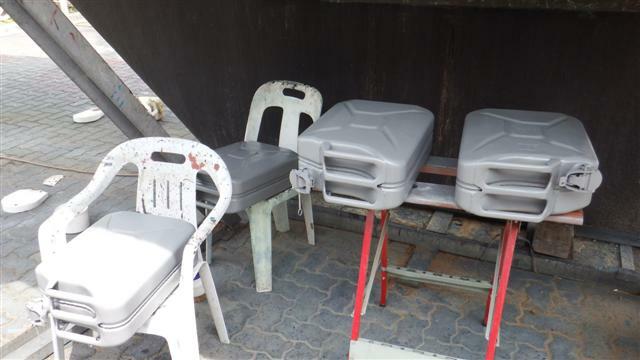 These stalls were selling uncovered chicken that was open to all the flies and didn’t smell very nice – yummy! 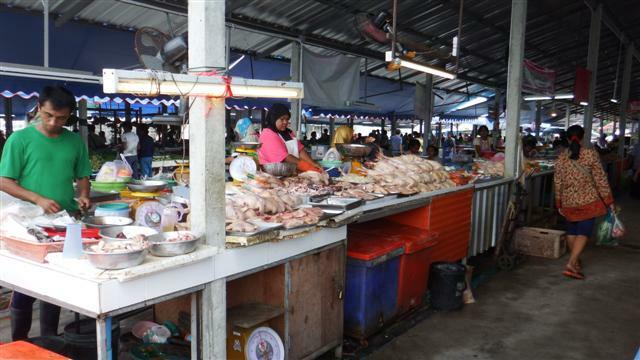 The fish stall was even worse but I didn’t chance going close enough to take a photo. You could smell it from 10 yards. We found a nice restaurant for lunch and wandered back to where we had agreed to meet our little taxi driver. Bill managed to sniff out this hardware store on the way back. We took the ferry back to Kuah on Langkawi and nervously queued for our passport stamp. Luckily the lady we spoke to was still on duty and remembered us and gave us our 90 day stamp – job done. 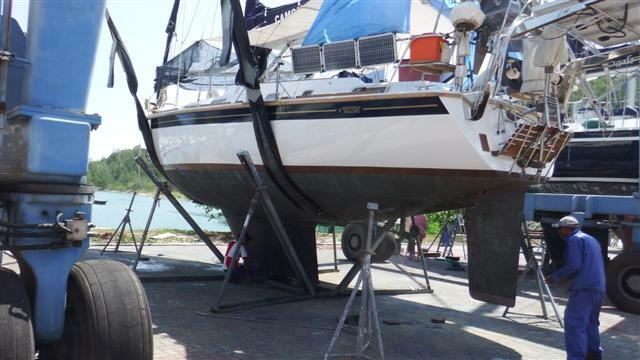 Wednesday 22nd While I was out for my run Bill resolved the rudder problem. 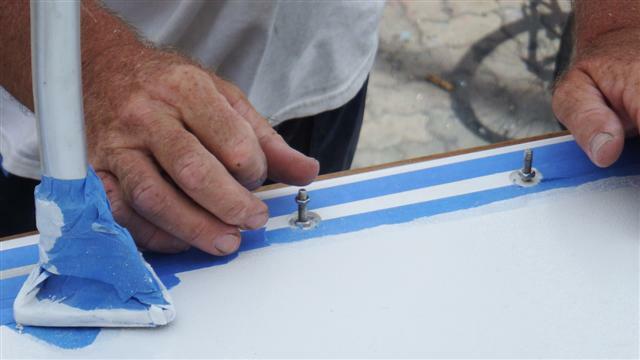 By using the studding he was able to lower the rudder enough to turn the quadrant round and wound the rudder back into place. This photo is looking down into the cupboard and the offending part is the black quadrant on the left of the photo. 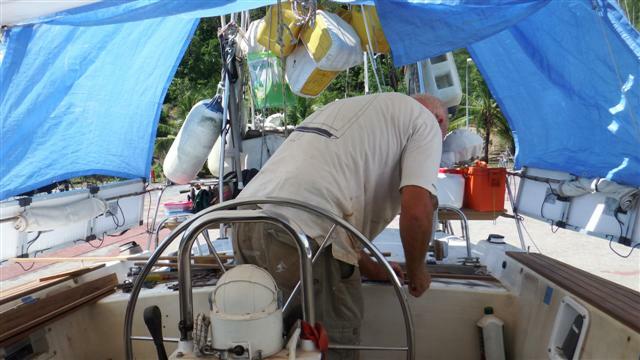 Bill reconnected all the steering and autohelm parts. Luckily we weren’t in the water. Finally Bill put the cupboard back in place ending almost 3 months of sleeping next to the ‘hole’. The mattress was rolled back into place and I made the bed. 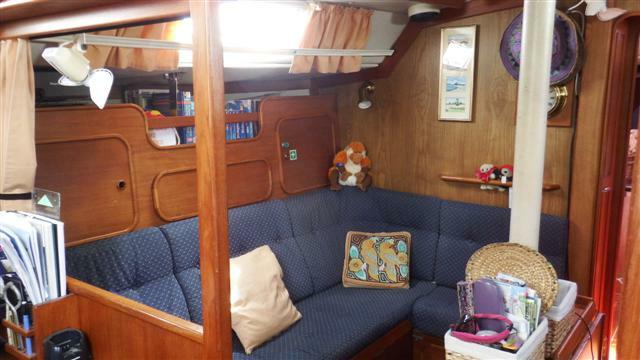 Our cabin was back to normal apart from the headlining but that will be addressed later. 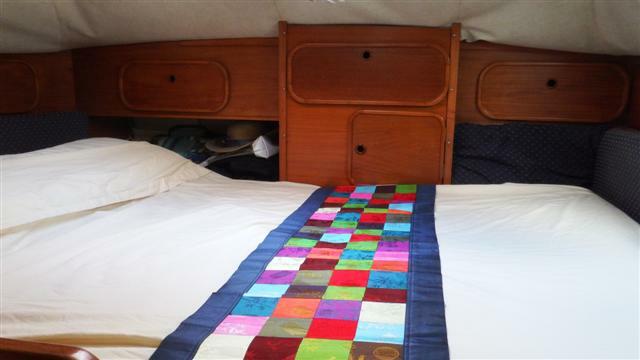 If anyone is interested in how Bill built the bed in the first place see Bill’s technical article Blue water comfy bed on the website. In the next few days lots of little jobs were achieved. 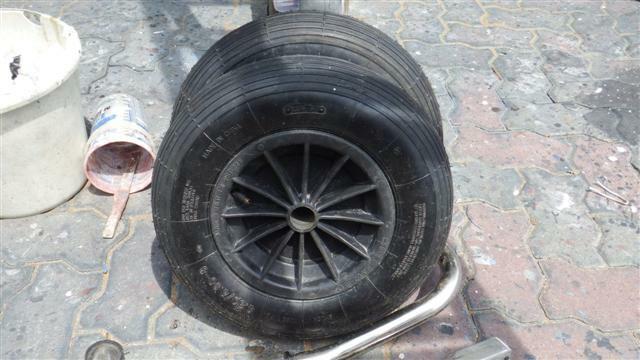 The tyres I had bought in the UK and brought back in my suitcase were put on the dinghy wheels but the wheels were taken off the dinghy because Bill rubbed down the transom of the dinghy for painting; probably when we’re back in the water. 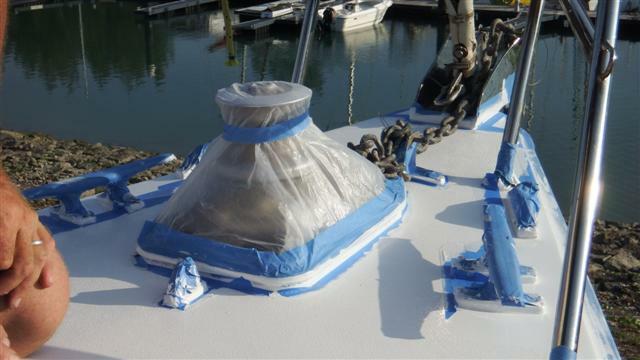 We managed to get the dinghy back on the davits. 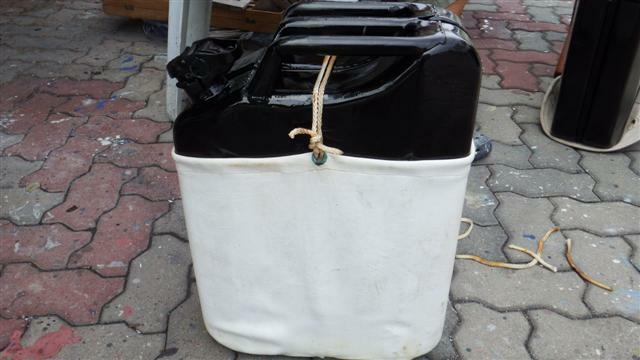 We carry a number of diesel jerry cans above and below decks. 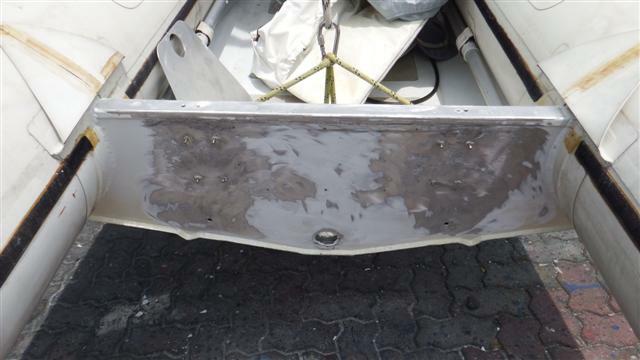 The ones from the bottom of the deck locker were getting really rusty so they were taken out, the rust was ground off with an angle grinder and Bill re-sprayed them. First with a prima and then the next day with black paint. I put their coats back on. 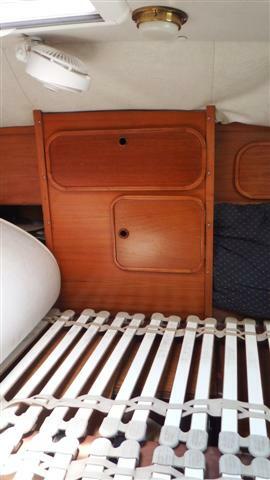 As some of you know we have a central heating system in the boat powered by an Eberspacher diesel unit (which isn’t working at the moment; it’s on the list). A bit crazy in the tropics you may be thinking but remember we are circumnavigating the world and intend to go back to the UK when we’ve completed it. 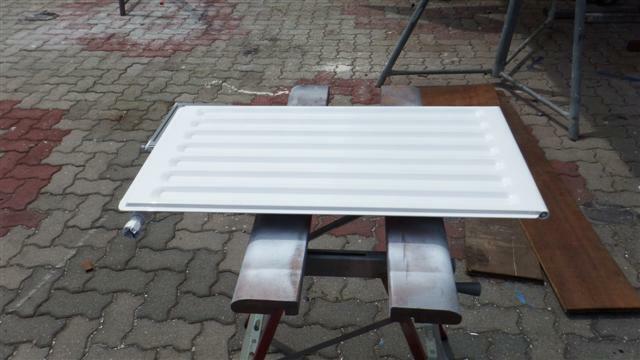 For that we’ll need heating and some of the radiators have gone rusty so Bill took them off and sprayed them. It’s something he wanted to do. You don’t get either of these here very often. You can count the motor cruisers on one hand in this marina; mostly sail boats here. 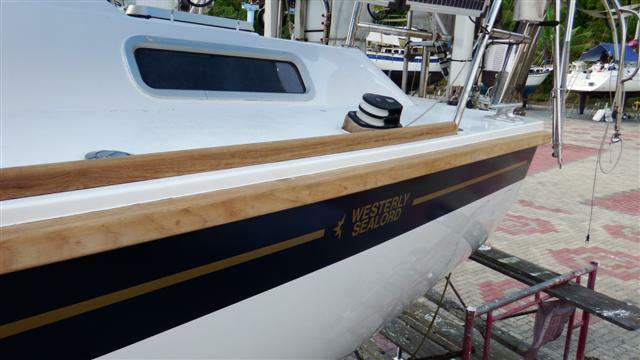 You don’t normally see old traditional wooden boats either; it’s a bit too expensive for the locals but an American guy who is doing it up owns this one! Most of the woodwork was completed now, even though not all of it was attached yet, and Bill had very little left. Our curtains are held back with a piece of headlining material that’s gone a bit saggy so Bill has used the last of the wood to make some new curtain retainers. It didn’t take him long. 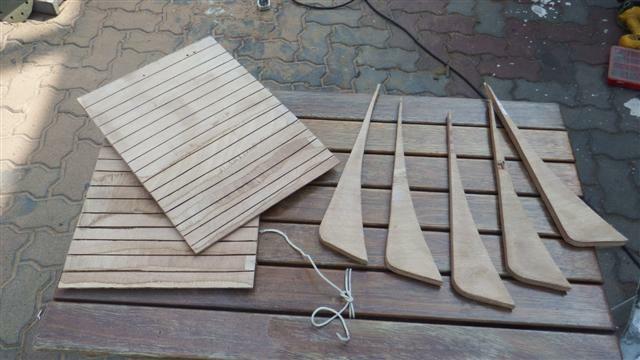 They will slot into these, which are made from the parts cut out from the new grab handles. 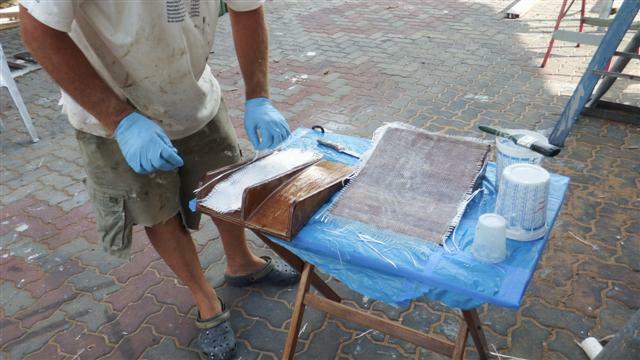 As they are going inside they were given several layers of varnish. 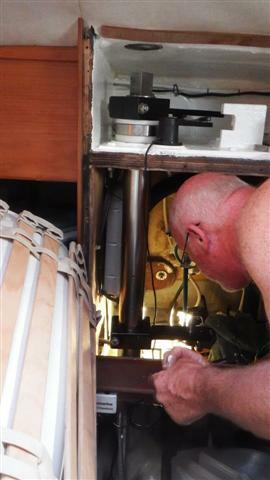 Friday 24th the boat next door owned by a Swedish couple had their rudder put back on and asked Bill to help. It was more complicated than ours and gave everyone a few problems. 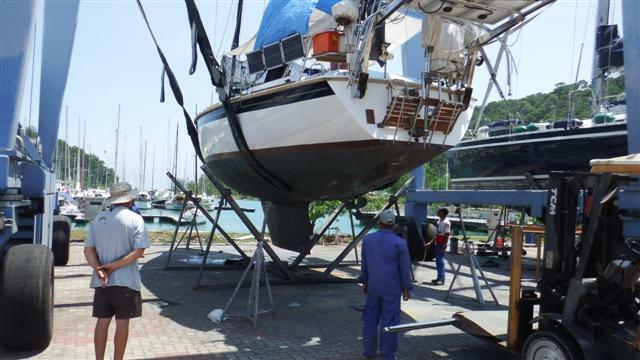 The yard boys lifted their boat off it’s cradle and got their rudder in place and proceeded to lower the boat onto the rudder. As they started there was an awful crack, I decided I was leaving and went off to the ferry for my usual trip to the Chinese man with a van. When I came back they were using the forklift to push it into place and apparently the crack had come from the piece of wood the rudder was sitting on. All ended well. So what has become of the mystery objects, well they will be connected to this. 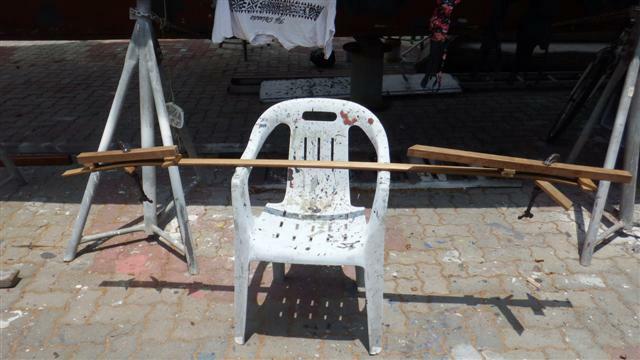 This is how Bill bends wood! Saturday 11th April was the first day that I started feeling like my old self. I had a shower, washed my hair and we jumped on the ferry to pick up one of Mr Din’s cars. Bill needed some more paint, sanding discs and other hardware bits and I needed to pick up some food and, more importantly, wine. I’d got a few bits in the marina shop and from the fruit and veggie man but we needed snacks, bread, and store cupboard stuff as well as the wine. We headed to Starbucks for coffee and later had lunch out. Every day normal stuff to a lot of you but a treat for me. 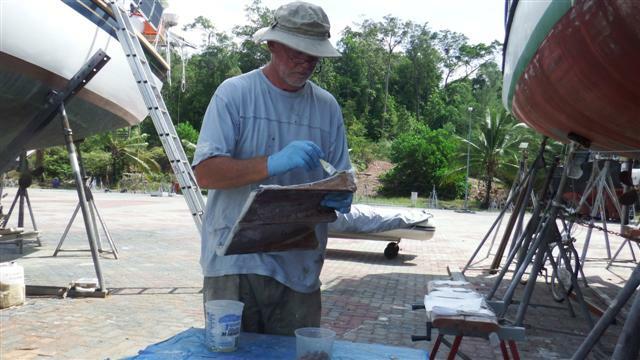 When we got back Bill started masking the stanchion bases ready to attach them the next day. Sunday 12th back to work again. We still didn’t have any stanchions or guard rails so the next job for Bill was fit the bases in between the new toe rails. 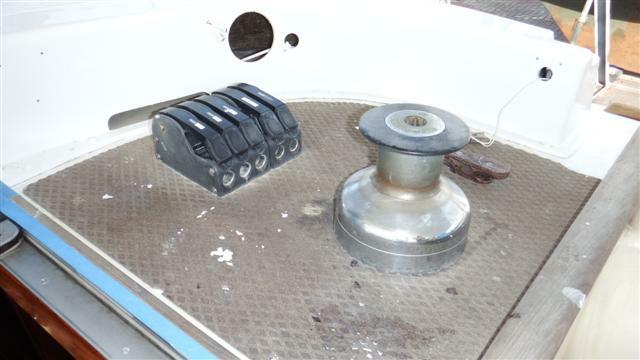 Bill was able to reuse some of the bases but I had bought 4 new bases as well as 6 new stanchions in Port Solent and brought them back with me. Bill attached the bases with bolts and a layer of sikaflex under them. 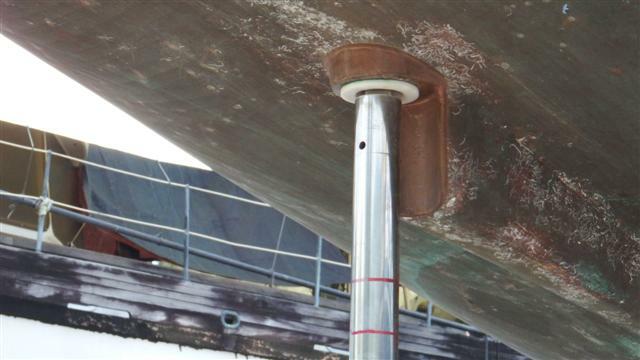 Unfortunately the stanchions can’t be fitted yet because they need bending to shape and that’s classed as an in the water job. We have so much to do we have to prioritise and stick to jobs that we’ve decided to do before we get dropped in, which could be next week. 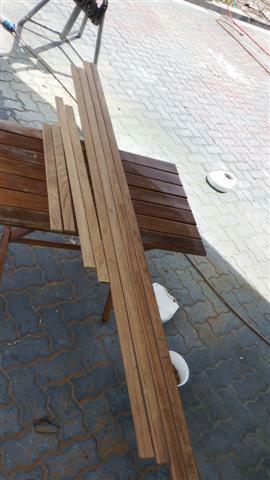 The deck looked great when he’d finished but still missing a lot of fittings. I had managed to remove the blue tape from everywhere; it takes ages to remove it neatly. I changed the bed and fitted the lovely new mattress cover, fitted sheet, pillow covers and pillow cases I had brought back with me. They had been wrapped round the stanchion bases to protect them. I like putting my washing outside to dry. Bill had created a bit of a back yard for us. The boat to our left is an old tub that looks like it’s been there for years but on our right side the boats have been coming and going and our ladder always gets moved because it’s in the way so Bill has put it on the other side. 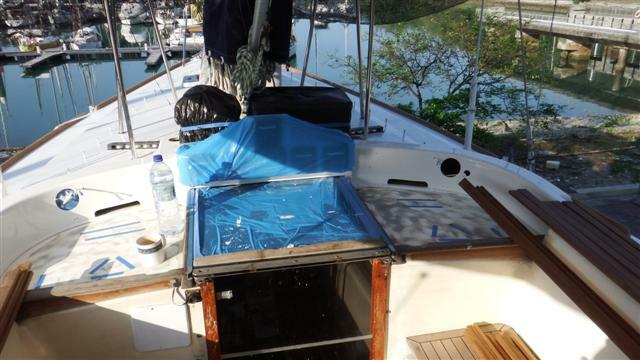 Bill has his ‘workshop’ under the left hand side of the boat out of the sun. The dinghy is our front fence and I found a couple of old chairs lurking around the hard stand. So we have our tea breaks in the garden. 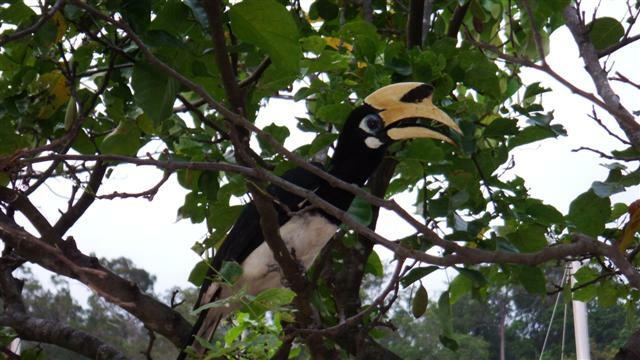 This is Harry the Hornbill, he’s beautiful and very young but he’s decimated the tree in front of us eating the new leaves. He watches us sitting in our garden. Monday I got up early to start my joggy trots again. I had bought some lovely new trainers in Kent with James’s help and wanted to try them out. It was like running on air. 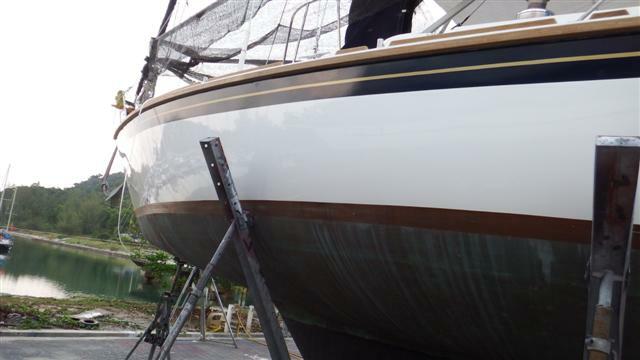 Bill spent the day waxing the hull, which is the last job he needs the scaffold tower for so we could hand it back. 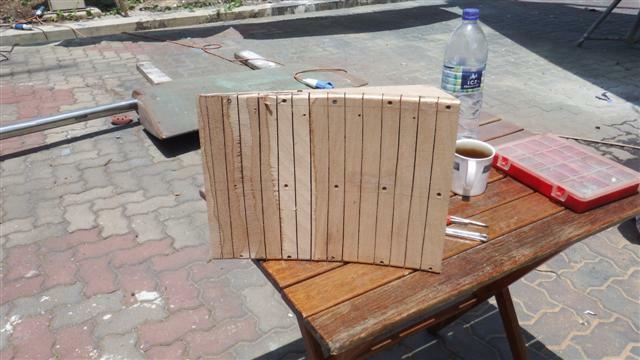 Tuesday and Wednesday Bill worked on preparing more woodwork. Among other things he sanded down the cockpit grating. It came up like new, as did all the other bits he’s renovated. I removed the very last of the blue tape, I still keep finding bits, and continued writing my blogs trying to catch up. At the end of the day we went to the pool, the first time since I’ve been back. Thursday was cockpit day. 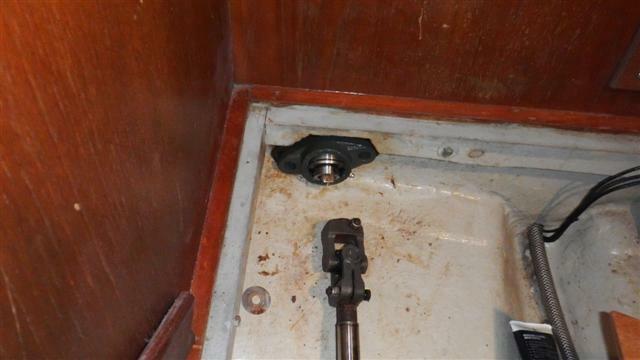 The winches, clutches and cleats had to be removed so Bill could start preparing the new teak decking that he intended to replace the treadmaster with. 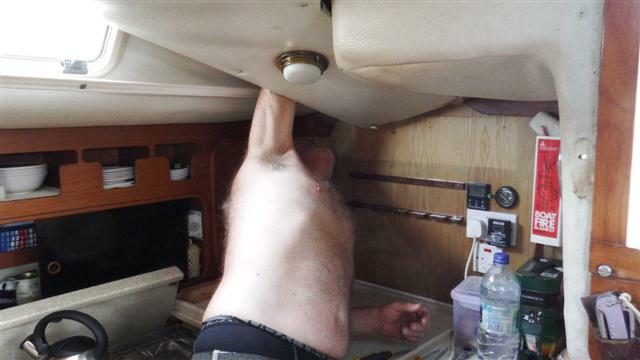 Unfortunately the bolts that had to be removed to get them off were covered by the headlining and Bill struggled to get underneath it. 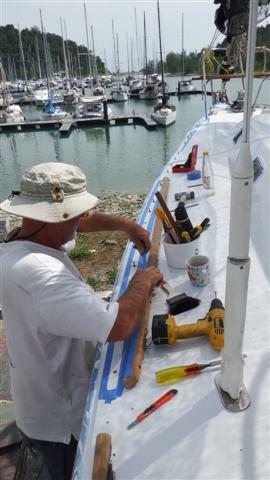 To take the headlining panels down is a major disruption, which is why Bill chose to paint around some things on the deck rather than remove them. It took several hours but between us we eventually achieved it. You can see the contrast between the new paint on the cockpit combing and the old GRP in the cockpit. The cockpit painting is another ‘in the water’ job. 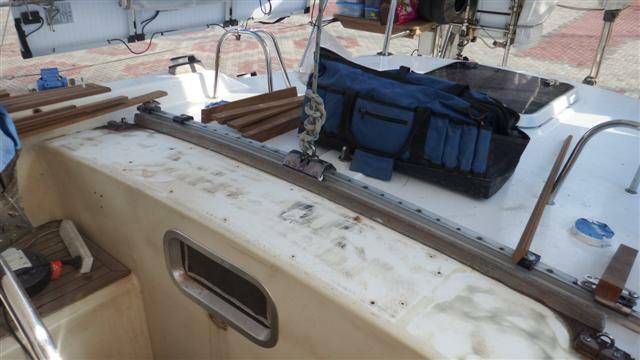 The big sheet winches had to be removed too, which had Bill contorting into awkward corners of the deck locker and under the headlining above his workbench. Eventually they were all cursed into submission! 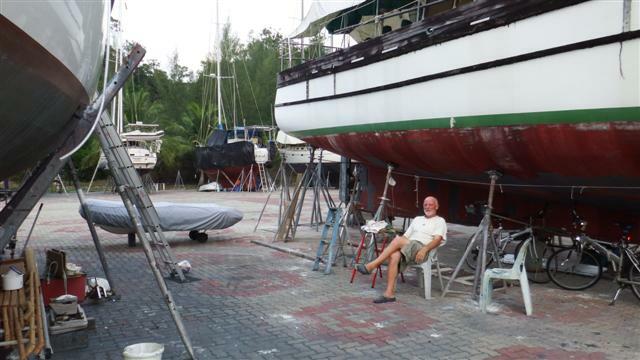 Finally the treadmaster had to be ground off creating an awful dust cloud but leaving a lovely smooth surface for Bill to start creating his teak bridgedeck that he’s always wanted. Friday I went for my usual trip on the ferry with my friends to do our shopping with the little Chinese ‘man with a van’. 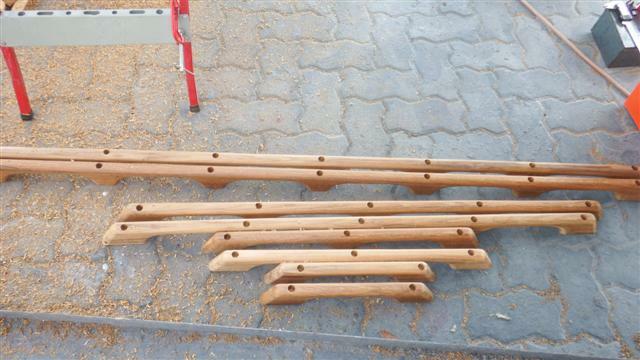 When I got back Bill had started making the pieces for the new deck. The first piece had to be made curved and took Bill a while shaping it with a bobbin sanding head on his drill. For the next piece he used a jigsaw, he pointed out that he was using my Dad’s old jigsaw, I think Dad would have approved of its use, that’s if he didn’t cut his hand off in the process! By the end of the day, after many times up and down the ladder, he had produced this; it’s going to look stunning when he’s finished it. 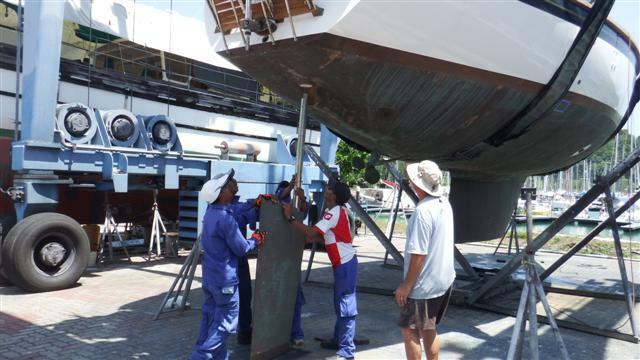 We were supposed to go back in water on Monday but we’re not ready so we’ll have the rudder put back on instead. 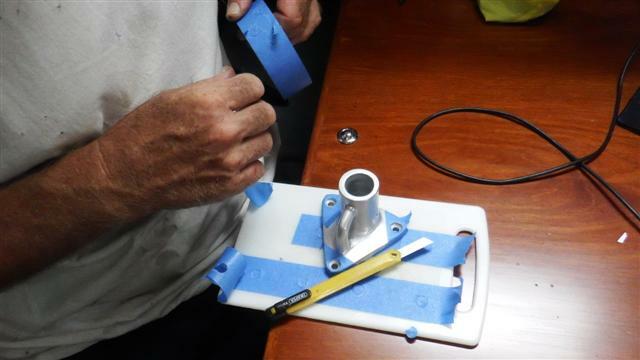 Meanwhile Bill is creating another mystery object, what can it be? Sunday 5th April was Easter Sunday. Last year I didn’t even get the sniff of an Easter egg; this year I bought some Easter bunnies to take back with me. 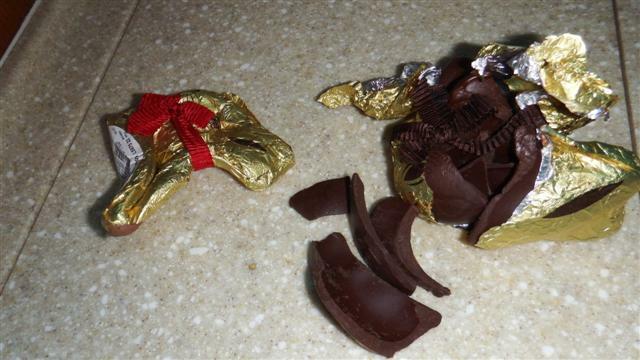 Sadly one was smashed to bits and there was chocolate everywhere, the other one had melted and collapsed. Don’t worry fortunately both were still edible! So it was Easter bunnies for breakfast in bed before the unpacking started. Most of my washing was done thanks to my sister but Bill hadn’t done any while I was away. Fortunately (or unfortunately if you got too close to him!) he hadn’t changed much either so there were only a couple of loads to do! I spent the next couple of days feeling generally under the weather. I’d arrived back with a really bad cold that I’d caught from Angela’s hairdresser, I always suffer from jet lag for several days and I felt homesick. I’d had a lovely time in the UK and although it was good to get back to Bill I missed everyone. 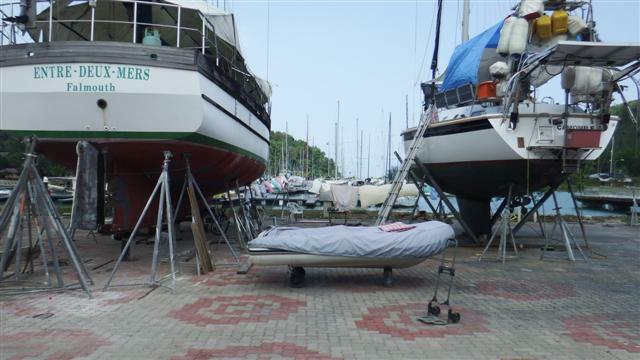 It didn’t help that the boat was covered in dust and the cushions were still over in Norsa. 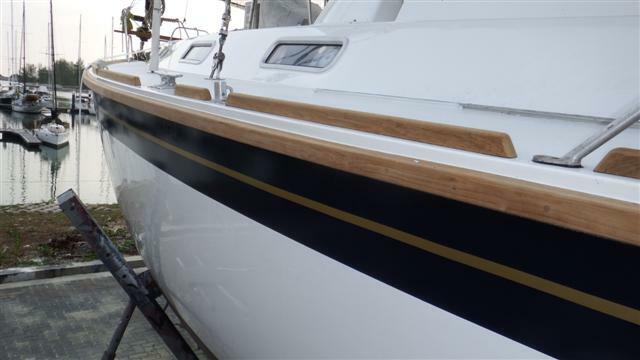 Poor Bill had spent half a day before I got back cleaning and changed the bed but it was only ‘man cleaning’ and the boat needed a good spring clean. 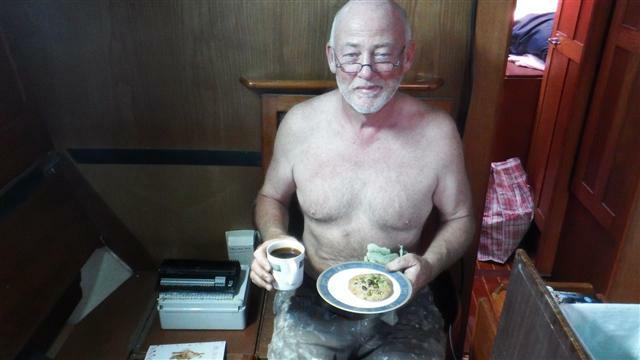 This is Bill enjoying his ‘Thomas cookie co’ cookie; one of 5 that managed to get home in one piece. You can see the general state of the boat behind him. 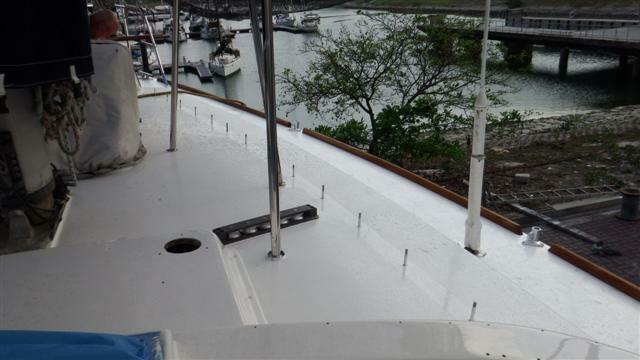 Bill had one more coat of the topcoat with the non skid granules to do so continued with that. I can’t believe the difference in the boat, it’s incredible what he’s achieved. 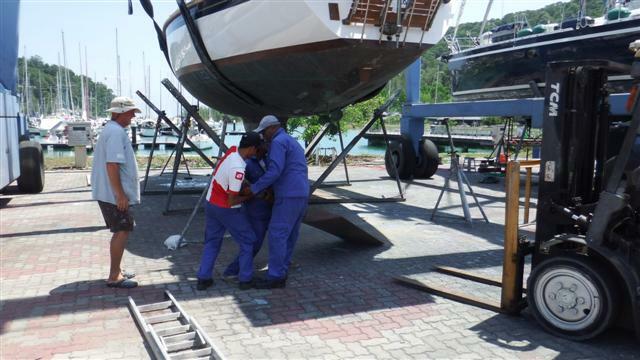 His work has received lots of compliments in the boat yard, from professionals as well as fellow yachties. 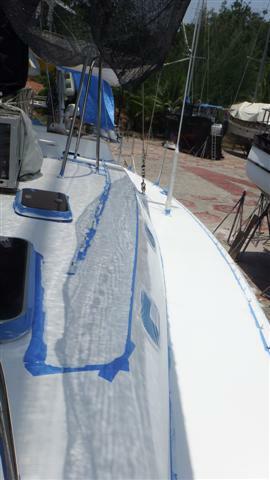 The deck is still covered in blue masking tape, which needs to be removed once the painting has finished. Bill thought that would be a good job for me, cheers, there go my nice long nails! I don’t mind really it’s nice to be able to help, there isn’t a lot else I can do really. Bill took this photo from next doors boat with me sitting in the cockpit ‘relaxing’. In between painting Bill got on with the inside jobs. One of the first things to fit was the new steering flange bearing so the floorboards could go back down and I could re-stow all the bags. 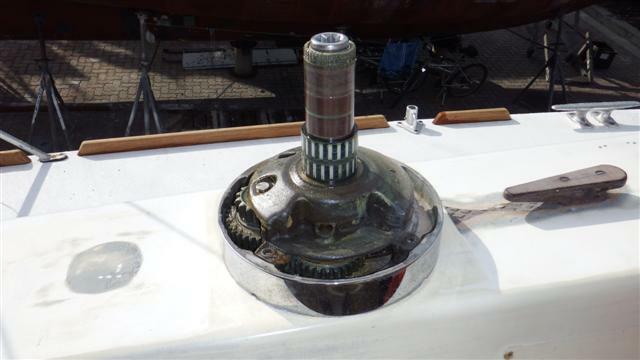 This is the gearbox, which Bill had out to service. 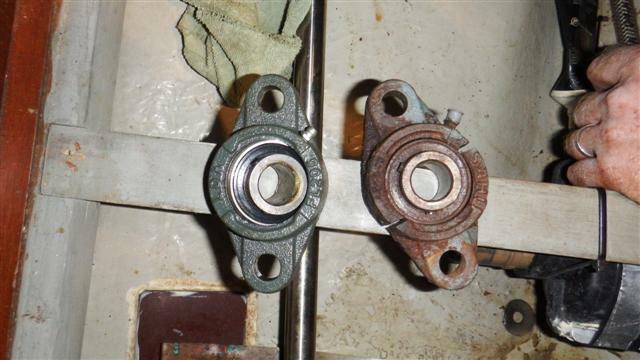 It was attached to the steering flange bearing that had seized and the bearings were like red dust. 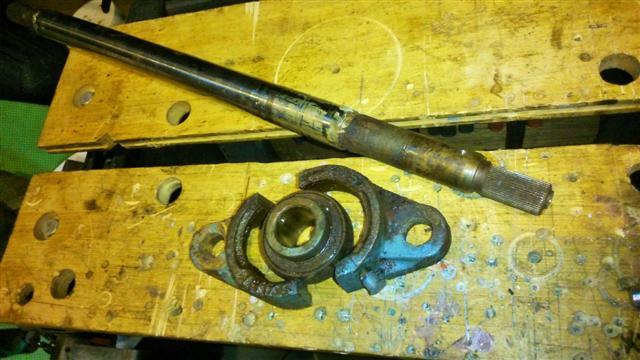 Bill had to cut it in half to remove it from the shaft, which fortunately was still in good condition. The new one was put back in place. Luckily Bill had found this problem otherwise it would have caused difficulties further down the line. The floorboards and the bed were put back. 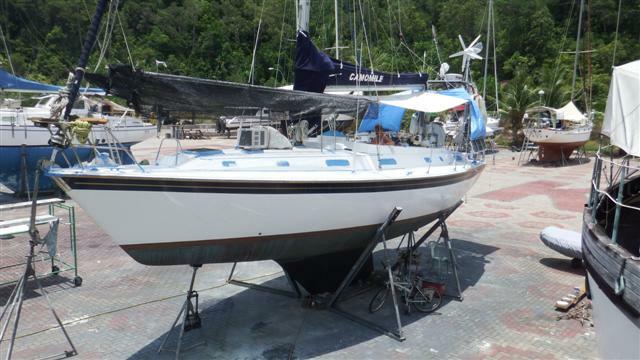 I spent the next couple of days washing (some of my new clothes had chocolate on them), ironing and repacking the bags although there wasn’t so much to repack because I left a lot of my winter stuff behind to make room for the boat bits and my new clothes. 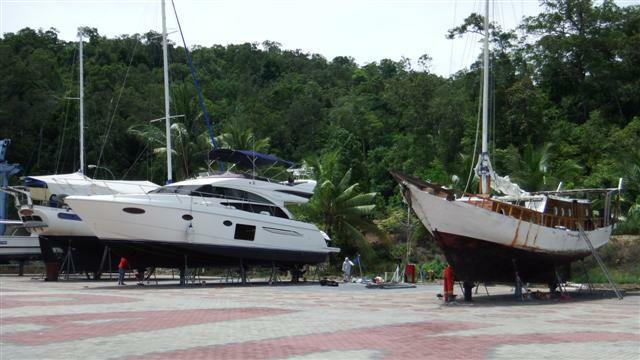 I took the ferry to Langkawi to do a bit of shopping in the local shops but I was still feeling fairly sorry for my self. 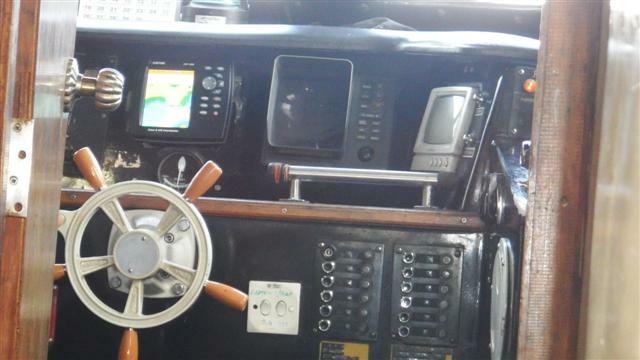 By Thursday I felt much better and set about spring-cleaning the boat. 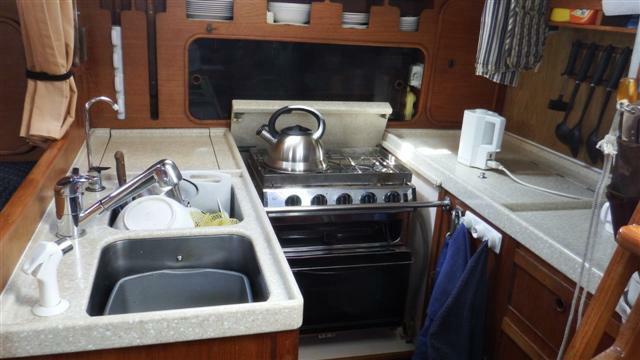 I took clothes out of cupboards, books off of shelves, ironed the curtains and re-hung them, cleaned all the galley and generally cleaned away all the dust that had inevitably spread itself around while Bill had been working on below decks projects. The newly varnished floorboards looked much better once they were clean. 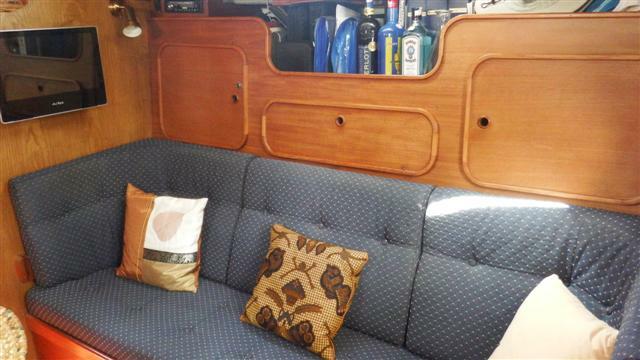 All that remained was to get Norsa’s keys and go and fetch the saloon cushions. 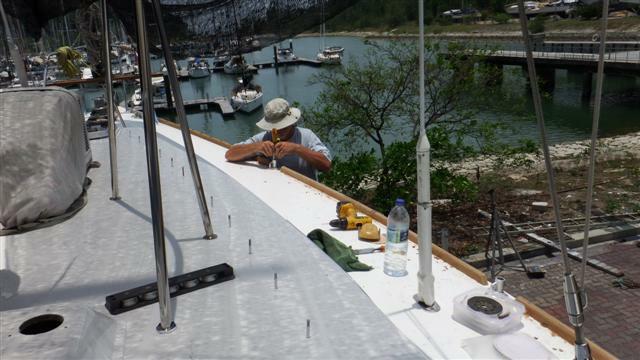 Before I returned Bill had signed up for another 2 weeks on the hard so he could finish his woodwork in the shade of the boat. These are the new grab handles. They won’t be put on yet because Bill is concentrating on completing the ‘out of the water’ jobs which includes anything that can be achieved by using the scaffold tower rather than working on his knees. 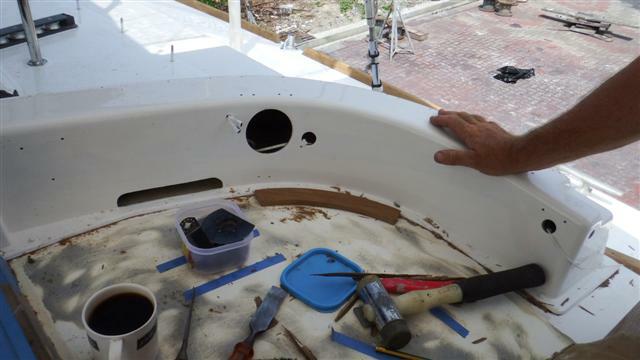 Also on the Thursday Bill started replacing the toe rails. 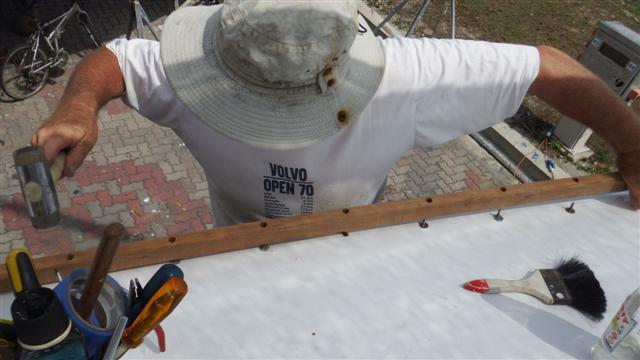 You may remember he had removed them by cutting off the top of the screw heads, easing off the old wood and leaving the stud of the bolts in place. Now the painting was finished the toerails were next. First a special home made cutter was used to create a shallow counterbore around the exposed stud. 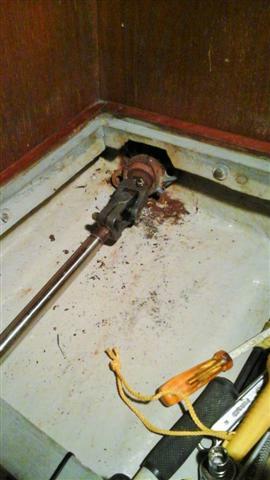 This then took a square nut, then a lock nut and provided a recess to pot them with epoxy resin once they were seized hard to the stud to discourage it from turning when the toerail was loaded. The toerail is tried for size. 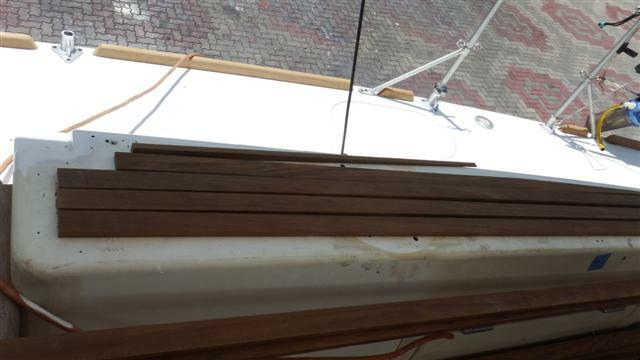 Note the curve that the wood has got to bend to. 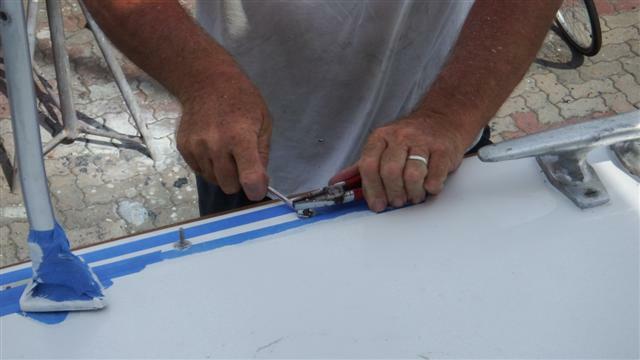 A fresh layer of blue masking tape is applied which Bill scores around the toerail with a knife to leave the centre of the masking tape free. The toerail is also masked up. The black Sikaflex is applied and the toerail is eased into place. 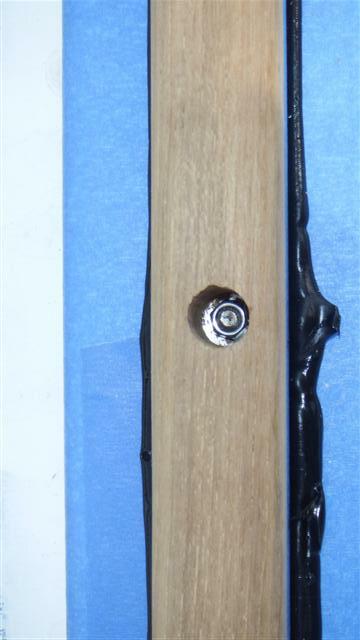 A washer and a third and final nut is loaded into the counter bore in the top of the toe rail and is tightened down (without the stud spinning) to squeeze the mastic out from under the rail. 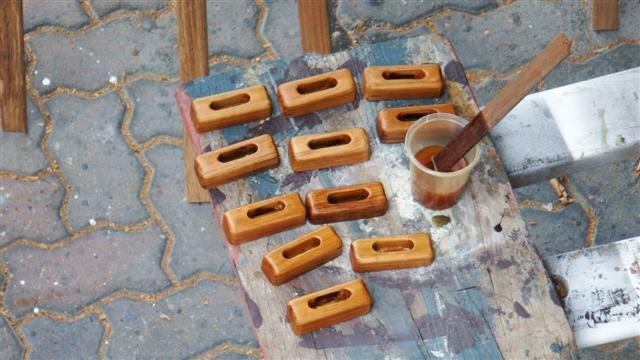 Finally Bill plugs the holes with his home made plugs and epoxy resin. When it’s dry the masking tape is removed leaving a nice clean finish to the job. It took two days to attach the new toe rails to both sides. On the Friday evening after he’d finished the heavens opened and we had a massive downpour. It rains in paradise too. 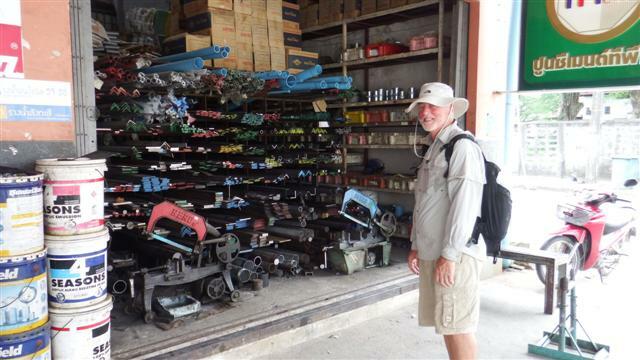 Meanwhile in Malaysia Bill had been getting on with his jobs, he took the steering and gearbox out to overhaul. It was fortunate that he did because a steering flange had broken in half and I had a last minute call to order a new one. The gloss paint had arrived so he was getting on with the topcoat painting. 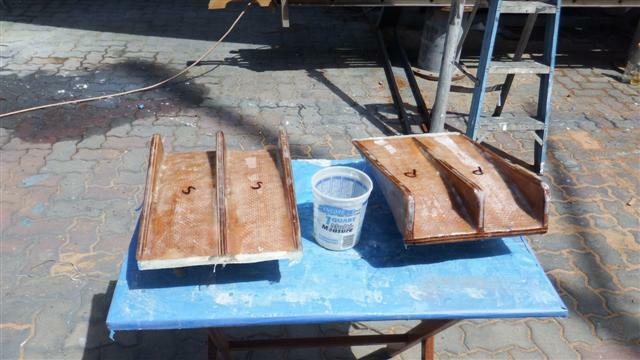 There were the same issues with painting in sections and being very careful with drips and sags. 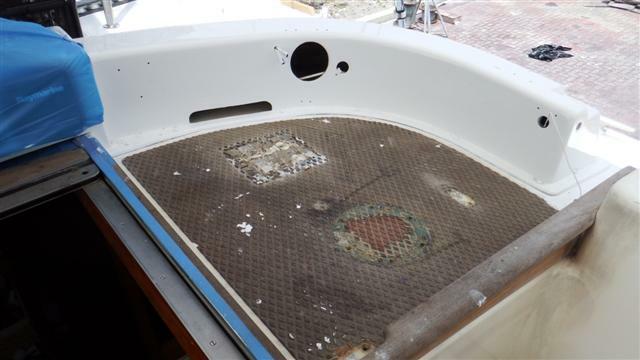 The topsides were harder to get a good finish than the hull because of having to paint around windows, shrouds, etc but of course he managed it. 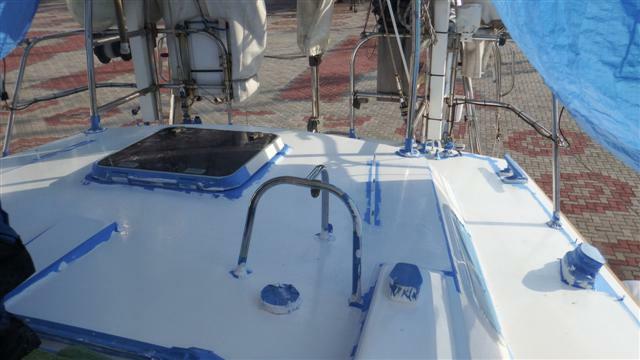 Once he had painted the 2 topcoats, with a very light rub down in between, he had to wait a few days then remask on top of it so he could paint the side decks and coach roofs with the anti skid granules added to the paint. It’s difficult to see in this photo because the sun is so bright. Thomas and Sonal in their car and James and I in Alan’s car paid a quick visit to Mum’s grave to lay some flowers then headed down to Havant to ‘invade’ Claire and Gordan again. We spent the afternoon in Chichester where I had to buy a new backpack to get all my new clothes back to the boat. 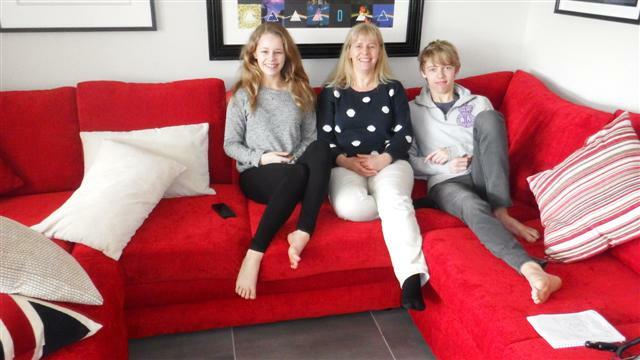 We had a wonderful evening with them but the next morning James and I had to leave for the airport. Thank you for having all of us Claire. 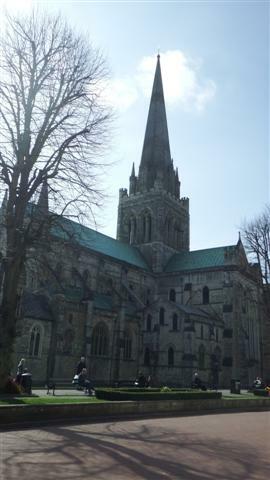 I forgot to take a photo of us all so I’ve added one of the lovely Chichester Cathedral instead. I continued onto Amanda’s to return the car and spend my last couple of days with her and the family. Jasmine and I were laughing at the photos I’d taken of the wedding. During the afternoon I completely unloaded the car and laid everything out on her floor to repack. Some of the heavy stuff had to go in my hand luggage because my bags were way too heavy with all the boat bits I was taking back. 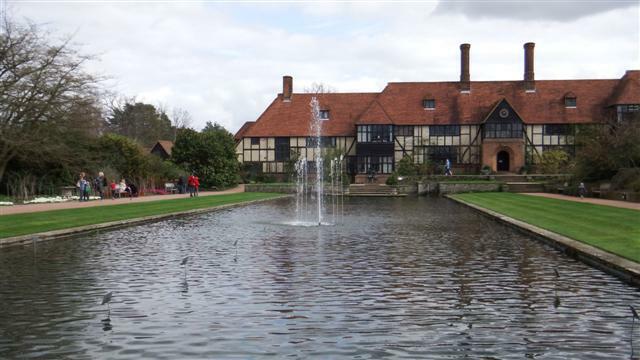 Wednesday 1st April turned out to be a lovely day so Amanda and I went to Wisley gardens. Unfortunately we forgot it was Easter holidays and it was full of Mum’s and kiddies but there was plenty of space for everyone. 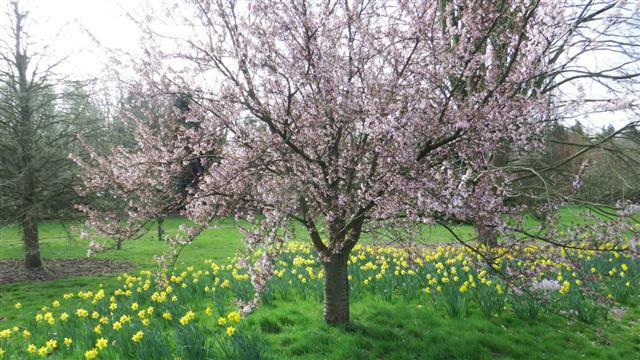 The daffodils and the spring blossom looked delightful. 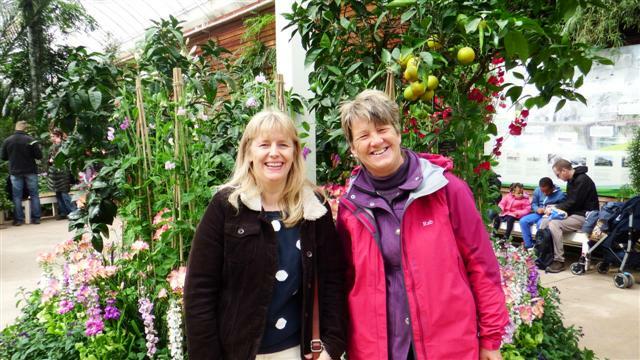 Amanda and I had a wonderful day wandering among the flower gardens. I was probably taken as a child but I don’t remember it. We decided to beat the rush and have an early lunch before continuing on our tour. The café was filling up fast but we enjoyed a delicious lunch together. Afterwards we went into the tropical greenhouse. Haha there were plants in there that I see in the wild everyday but it was lovely to wander. A little robin followed us in, probably my Dad coming to watch us. It was nice and warm in there but we kept our layers on. 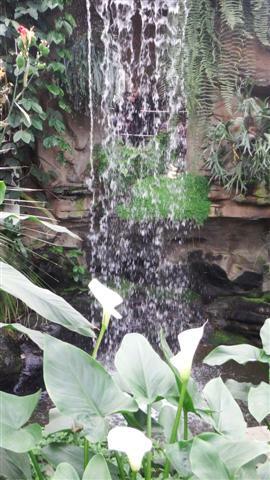 It smelt exquisite with all the lilies and orchids in flower. 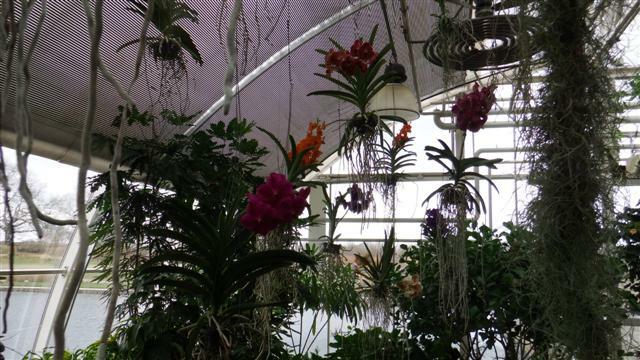 The orchids were all suspended from the ceiling with wire; they looked really eerie just hanging there. The centre piece was a magnificent waterfall which was very reminiscent of the ones we have over here but it lacked the sounds and smells and, of course, the heat. 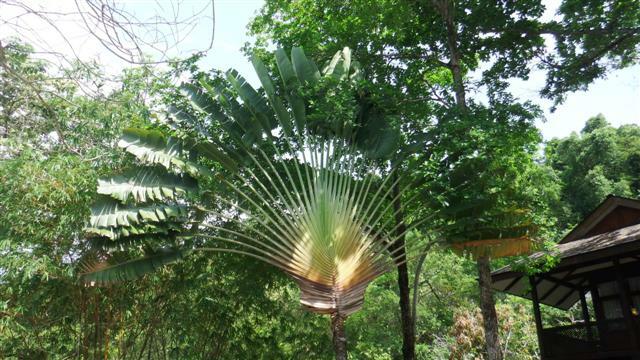 The tops of the beautiful banana palms were touching the roof and trying to get out. 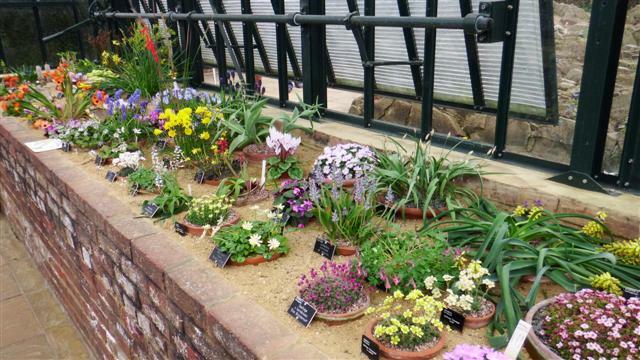 Some how it seemed sad seeing these beautiful plants hemmed into such a small space, a bit like a horticultural zoo! 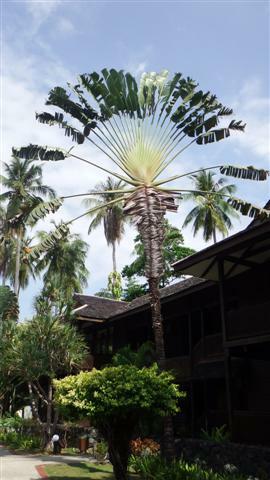 When I get back I’ll post some photos of the banana palms on the island. We continued our walk passing the alpine garden that I loved so much. I needed to get back and finish the packing so we didn’t linger too long. Thursday 2nd and the packing was finished so we spent the morning chatting. It’s a very fine balance between staying with someone and having some quality time together every year or so or being able to pop in whenever you want, which you don’t normally find time to do in a busy life style. I felt I had some quality time with my sister and Tristan and Jasmine. It was hard to say goodbye; more tears. Sally came to pick me up and take me back to where I’d started, at her house outside Gatwick. We had a lovely evening together out at a local restaurant for a scrumptious meal, my last meal in the UK for a while. 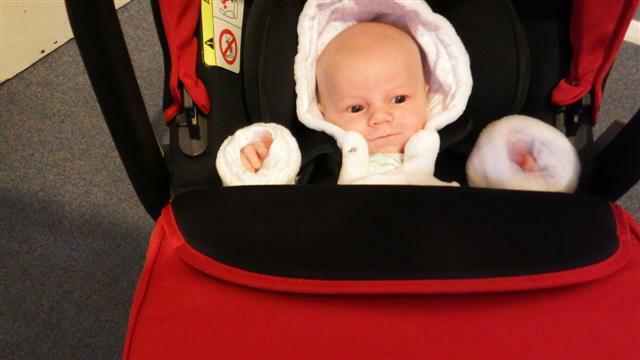 Thomas and Sonal came to the airport to see me off. I was very nervous about getting everything on the plane. Emirates were very good they didn’t even weigh all my bags together luckily and the 35kgs went into the hold. I still had my pull along bag, which weighed 20kgs, my rucksack with my new clothes in which was probably about 5kgs plus my computer bag so altogether I got about 60kgs on that plane. Goodbye England for a while. 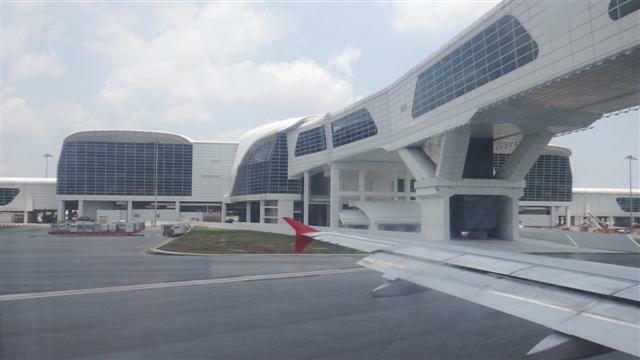 So I started on my long journey back landing at KL airport the next morning, which was the equivalent of 2am in the UK. 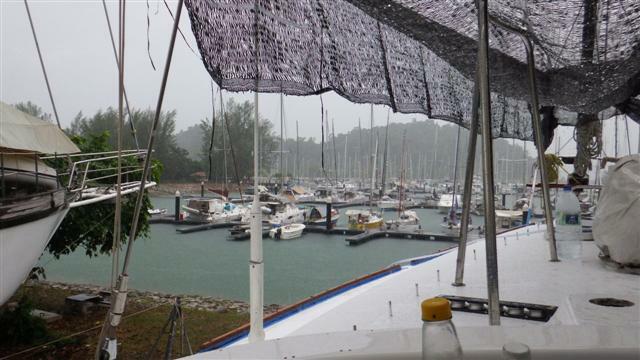 I had booked an afternoon flight back to Langkawi in case the plane had been delayed. I managed to get my entire luggage on the airport train to go one stop to the other terminal to catch the Air Asia flight. I spent the day wandering around the airport until check-in then finally got caught for costs. Even though I had booked 30kgs on the air Asia flight they picked up that I had 35 so I paid MYR222 (about £40) for the extra 5kgs. That was ok I deserved to pay something. 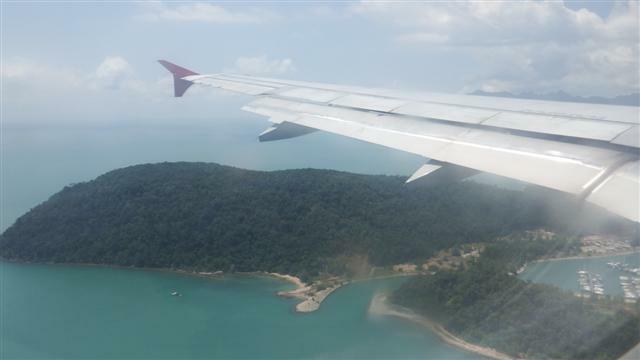 The flight to Langkawi was only an hour. The resort is on the edge of the flight path so I made sure I sat on the left hand side of the plane and got a good view of the marina as we came in to land. I could see Camomile sitting waiting for me. Bill was waiting to greet me with a big happy smile on his face.